Across the street from the beach-outside grill, table and chairs(fenced in)-off street parking-great sunsets-dog friendly, swimming-fishing-kayaking-biking-shell and stone collecting or romantic walks-short drive to historic cape may and famous wildwood board walks+amusement parks -shopping to much to list ask me. Close to many resort areas and parkway yet able to return to a peaceful area away from the hustle and bustle for relaxation. My wife, 15 lb. poodle and I enjoyed our long weekend stay. In on a Thursday and out on a Monday. Quiet surroundings and Joe was helpful with his knowledge of the area. Beautiful sunsets from the bay beach which was a very short walk. We would definitely go back. seeing all of you again . We had a great time staying at the Blue Cottage, very quiet neighborhood and a short walk to the Bay beach which has beautiful sunsets! We especially liked that we were able to bring our dog. He loved the beach! Our stay was lovely. The cottage is small but compact and is perfect for a small family traveling with a four legged companion, Joe and Mary were the perfect host and hostess available if needed but not at all intrusive. My only disappointment was the quality of the beach. It was on the Bay side and the beach was rather small and the water not inviting. Our dog, Luna, was very happy running about in a well kept manicured yard, barking at the rabbits that visited daily, and appreciative of the attention paid to her by our host and hostess. The great news is that proximity both to Wildwood and Cape May was perfect. You could spend the day at either place and then return to a quiet, clean home. I would recommend this VRBO to anyone looking for clean, comfortable, and close accommodations. 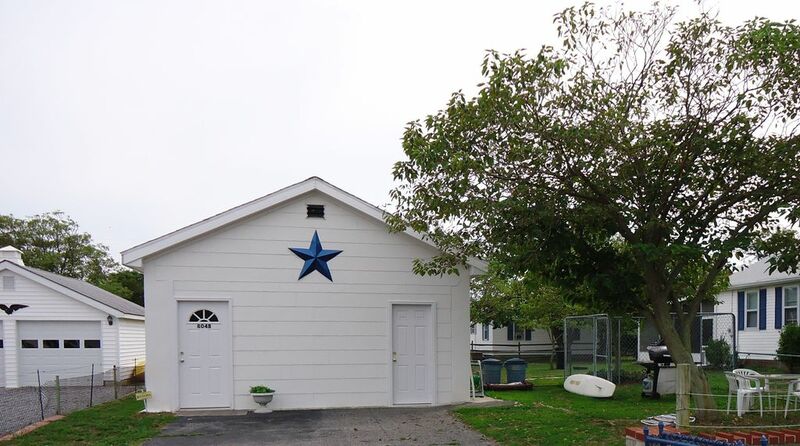 This property is in a great location ( a block off the bay)... minutes from Wildwood, Cape May & Stone Harbor. Our yorkies enjoyed their walks on the quiet streets . Joe lives right next door & answered any questions we had. Understanding pets are allowed , it could have been a little cleaner. person missed a couple spots and was made aware of. Joe’s place was perfect for our four day stay in Cape May! Half a block to the beach! This place is great! Includes a generous parking space and fenced in yard with plenty of rabbits for our dog to chase around. Joe provides beach chairs to make your venture to the dog friendly beach all that more pleasant. The kitchen is fully stocked with utensils, plates, cups, stove, fridge, a coffee maker and microwave! Two window units kept the cottage very temperate! Thank you Joe!! you back again in the future . Relaxing, comfortable and charming Stay!!! My husband, my two dogs and I spend 4 incredible days at the cottage. The property has an amazing location, is comfortable and super clean. The owners Joe and Marie are incredible, always making sure everything runs smoothly. Thank you Adriana , it was a pleasure having you ,Juran and the dogs staying at the Blue Star .Looking foward to seeing you and Juran back again .